The survey by research firm IDC said the global wearables market grew 26.1 percent from a year ago to 22.5 million units. Fitbit, which recently introduced its Charge 2 and Flex 2 fitness bands, captured 25.4 percent of the market with sales growth of nearly 29 percent, IDC said. Chinese electronics group Xiaomi was second with a market share of 14 percent, with modest sales growth of 2.5 percent, according to the survey. 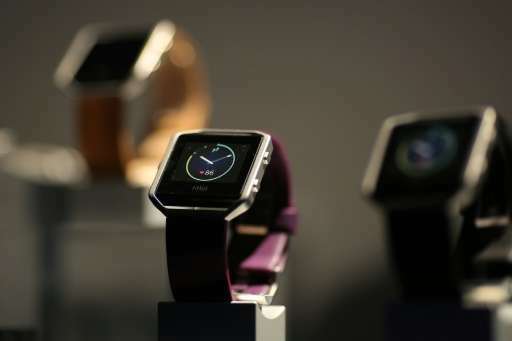 Apple, which introduced its smartwatch a year ago, saw a 56.7 percent year-over-year drop in sales of the device, IDC said. Apple, which does not release official sales data for the smartwatch, captured just seven percent of the overall wearables market with 1.6 million units sold, according to IDC's estimate. The California company has scheduled a media event Wednesday where it may unveil an updated Apple Watch along with a new version of its iPhone. IDC analysts said the market is bifurcating between basic wearables with a single function and more complex devices that accept third-party applications and functions like communication and mobile payments. IDC research manager Ramon Llamas said basic wearables accounted for 82.8 percent of sales, and more vendors continue to enter this space. "Smart wearables, meanwhile, are still struggling to find their place in the market," Llamas said. "There is plenty of curiosity about what smart wearables—particularly smartwatches—can do, but they have yet to convince users that they are a must-have item."